On June 13th 1956 Dr. Peck was commissioned the youngest pilot and officer in the U.S. Marine Corps, thrust into his first leadership position at the age of 19. His career has led him through the presidencies of three universities, membership on the president’s commission of the NCAA, and speaking engagements before groups ranging in size from 12 to 12,000. He’s addressed and delighted school children and women’s meetings, corporate CEOs, and eminent physicists, entertaining and informing them in their own areas of interest. 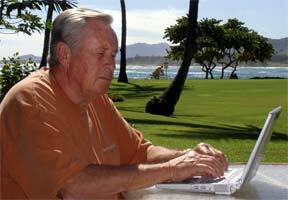 A playwright (a dozen produced plays), writer of industrial films and network TV shows, Dr. Peck has authored more than 20 successful books, from golf to popular history, crime novels, sports biography and scores of humorous travel columns for several magazines and newspapers. An after-dinner speaker since 1960, he’s spoken to c. 50 groups a year and enjoyed each conversation, an enjoyment that shines through his every presentation. Time after time, his listeners claim delighted surprise that a scholar and life-long academic (his PhD is in English) isn’t a stuffy Mr. Chips. He writes and speaks about topics so disparate as adobe construction, lessons on car theft, prison life, insurance underwriting training, world-wide travel… a broad spectrum of topics offered with charm and insight… as he will at your upcoming gathering.